That's what I have to say about the last 2 months. Some big things, some small things, some important things and some mundane things. Isn't that how is goes for everyone? I'm not even going to try to make a list, but I will do at least one photo for Brian, the girls and me. Let's start off with the biggest news. Sam is going on a mission for the Church of Jesus Christ of Latter-day Saints. She will be serving in the Mexico City South mission and she leaves July 8, 2015. What a huge decision for her! She is currently finishing up her freshman year of college in Southern Virginia and will be home by the middle of May. Brian is flying out there to drive back with her. They will have a fabulous trip and we are super anxious for her to get home. Sam skyped us when she opened her mission call. We crowded around the ipad and cheered for her when she told us where she would be serving. 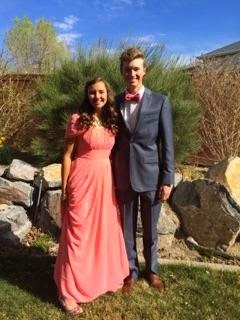 Sydney (like the rest of us) has been staying busy and was so happy to be able to go to Brighton High's Jr. Prom with the guy she thinks is pretty awesome. Brian and I were visiting Sam the weekend Jr. Prom happened but Syd's super nice date texted me about 25 pictures so I could feel like I was there. Awwwww. Gretchen thinks lacrosse is the bomb. She still loves swimming but, boy, does she love running the field and mixing it up with the girls. It's been a good season for her. It's been quite fun to watch Sydney and Gretchen enjoy lacrosse together. She also turned 15 in April. I'm not ready for another student driver. Julia worked extremely hard during this year's swim short course season and did not get the results she wanted. I was incredibly impressed with her efforts from September to March. She had some big goals and she worked so hard. She achieved some amazing time drops and remained very poised and put together when the time drops weren't enough. I am so proud of what she did this season. Her team was proud of her too and voted her the most inspirational swimmer in her age group. We ran down to St. George for a couple days during spring break. We finally hiked Angel's Landing. It's pretty spectacular. We did some mountain biking and some resting, which was nice! One last thing. When Brian and I went to visit Sam we took a little hike on the Appalachian Trail. We thought it was pretty neat to be able to say we've hiked on that trail. Of course it was a short hike, and cold (what's up with snow in Virginia at the end of March?) and we didn't have to have any supplies mailed to us along the trail, but still, it was the Appalachian Trail! So those are some of the things for the past 2 months. There are many more things to come!